Location: Silom Road Soi 6, Bangkok. Getting There: BTS Sala Daeng (exit 2), MRT Si Lom (exit 2). 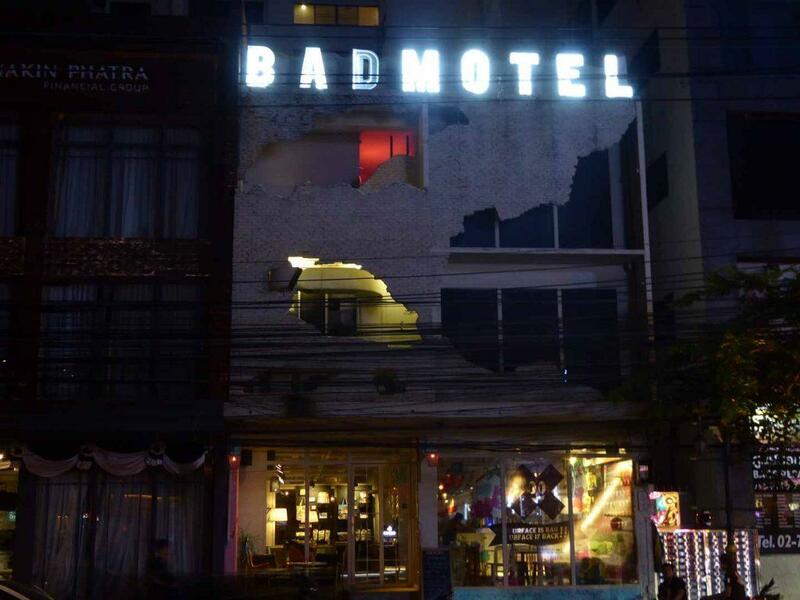 Bad Motel is a trendy bar, restaurant, and gallery in the Thonglor area of Bangkok located in a former derelict shophouse. The upper front exterior has cracked walls with gaping holes, behind which there are flickering neon lights giving the building a slightly sinister look. The interior décor is modern urban street style with its mostly white décor and furniture. There is a pleasant garden to the rear and a private dining room on the first floor. The walls are used for art and design exhibitions with the exhibits often for sale. The music is house, funk and hip-hop spun on vinyl by DJ’s with occasional live music. There is a Thai street food inspired menu with dishes from 150 baht. Beers start at 140 baht and cocktails from 190 baht. There is a happy hour from 17.00-20.00 with discounted Asahi beer and 2 for 1 cocktails. The crowd is mostly trendy young locals. 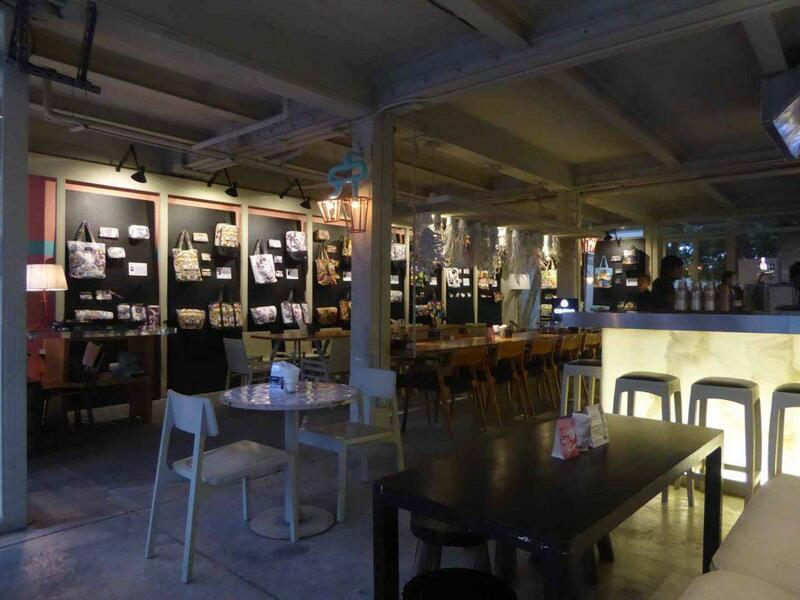 Location: 331/4-5 Sukhumvit Soi 55, (Between Soi 15 and 17), Bangkok. Getting There: BTS Thong Lo (exit 3). Turn left into Thonglor and Bad Motel is a 15-minute walk on the left-hand side just past J Avenue. 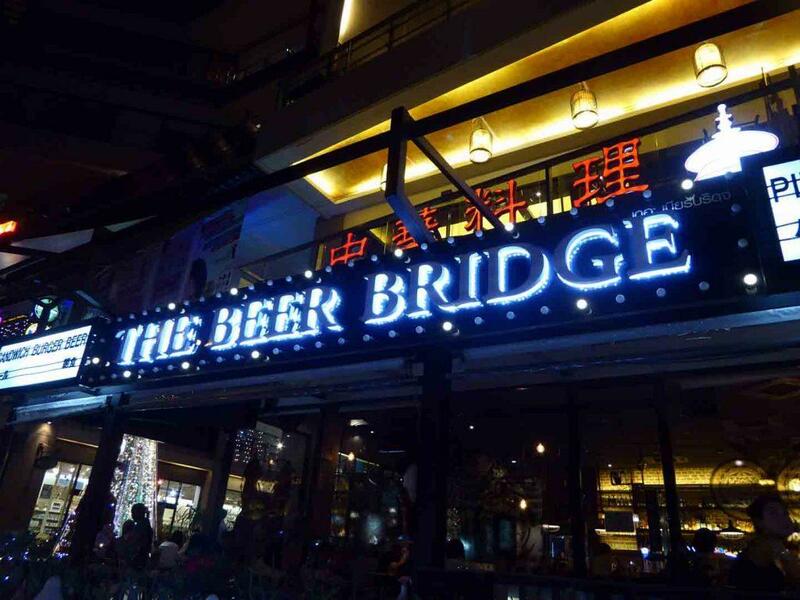 The Beer Bridge is a cafe restaurant bar on Soi Langsuan a short walk from BTS Chit Lom with a large selection of beers as you would expect from its name. The large bright high-ceilinged brick-walled interior bistro restaurant is more like a dining hall with its formal dining table layout. The raised front terrace is more dimly lit and is better for quiet drinking and conversation while a side terrace is well lit for dining and there is live music. The large International food menu features mains from 290-750 baht upwards. There is a pizza and pasta menu with ultra-cheesy pizzas for those who like their pizzas smothered in cheese. 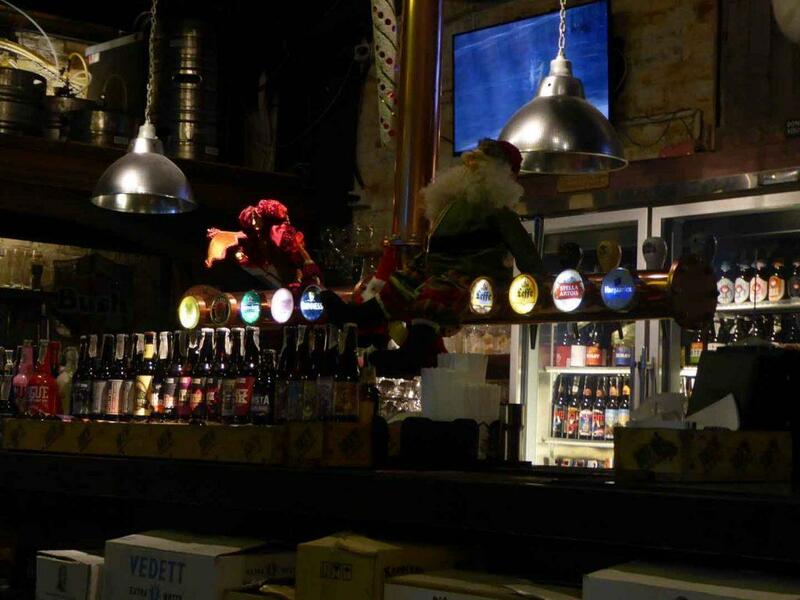 The beer selection is good with many Imported premium beers such as Vedett and La Chouffe from Belgium on tap as well as craft beers such as Punk IPA and a good selection of bottles. The beer starts from 150 for local brands and 260-350 for premium and craft beer. Service and VAT (17%) are added to bills. The crowd is mostly locals or tourists staying in the nearby hotels. Location: 1 The Portico, 31 LangSuan Road, Ploenchit, Bangkok. Getting There: BTS Chit Lom (exit 4). 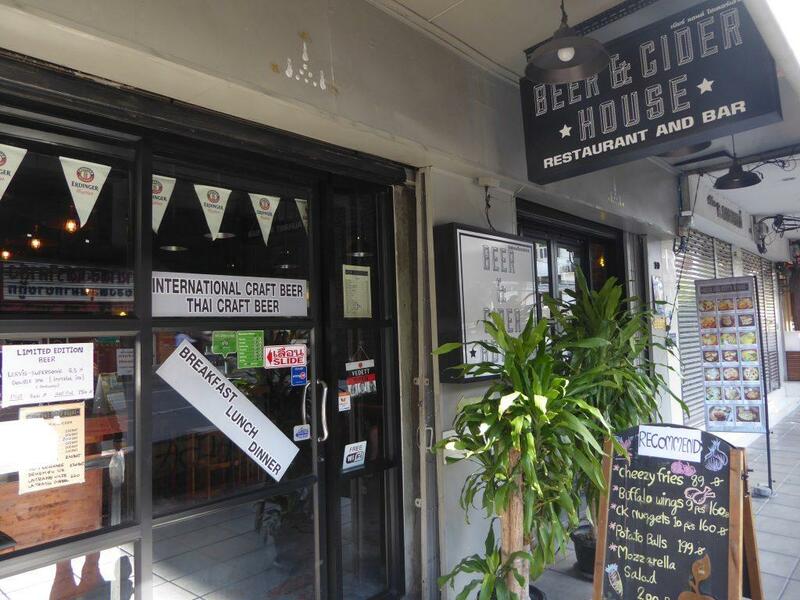 Beer and Cider House is a bar on Samsen Road near Khao San serving a large selection of local, International & Thai craft beers along with home-cooked food at reasonable prices. There are over 100 different bottled beers and ciders on offer as well as 8 rotating draft taps. 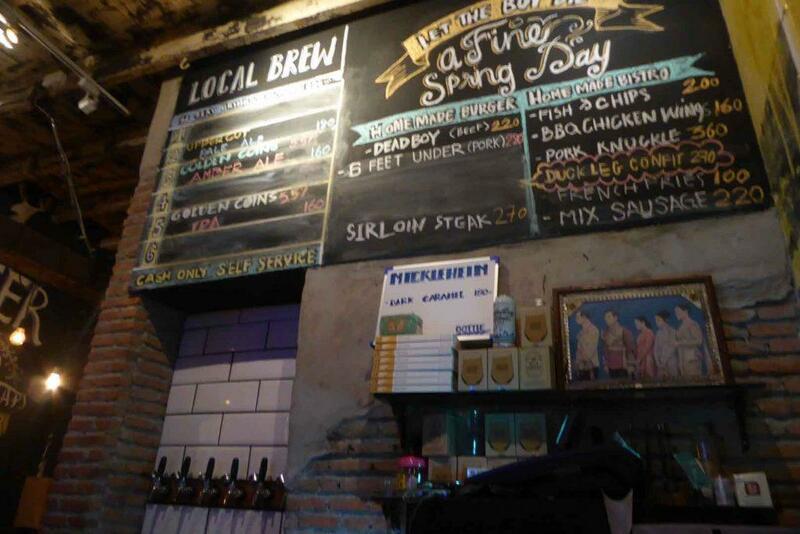 Local beers are 60 -100 baht, craft bottles 180 – 260 baht and craft drafts from 140 baht for a half pint and 200 baht a pint. Guinness and Magners are also on tap for 220 baht a pint. There is a good atmosphere attracting a mixed crowd of locals and travelers. There is sport on TV as well as free WIFI. The food menu is a mixture of Thai and European food including breakfasts, sandwiches & baguettes, snacks, salads, burgers, and pasta with prices from 85 – 359 baht. Location: 10 Samsen Road, Banglamphu, Bangkok. Opening Hours: 07.00 – 23.30 daily. Getting There: A short walk from Khao San Road. 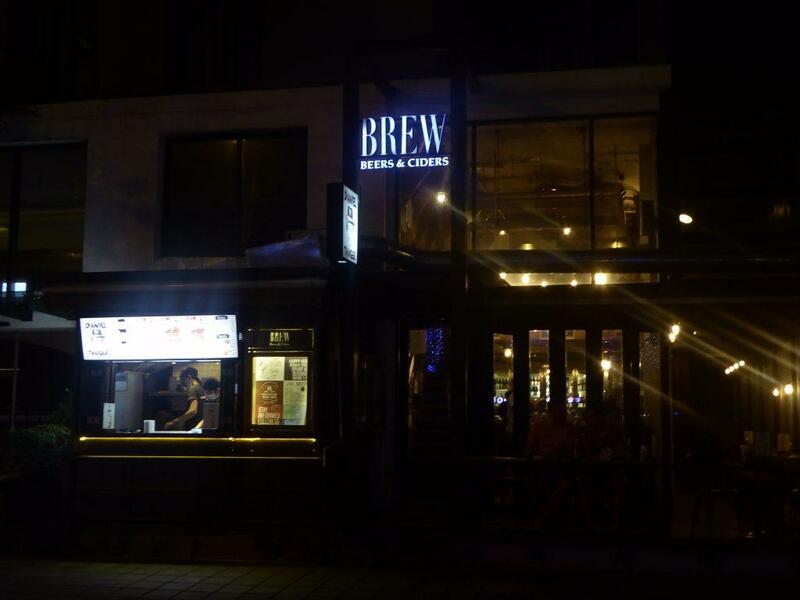 Brew is a bar specializing in premium imported beers and ciders and craft beers from all around the world. 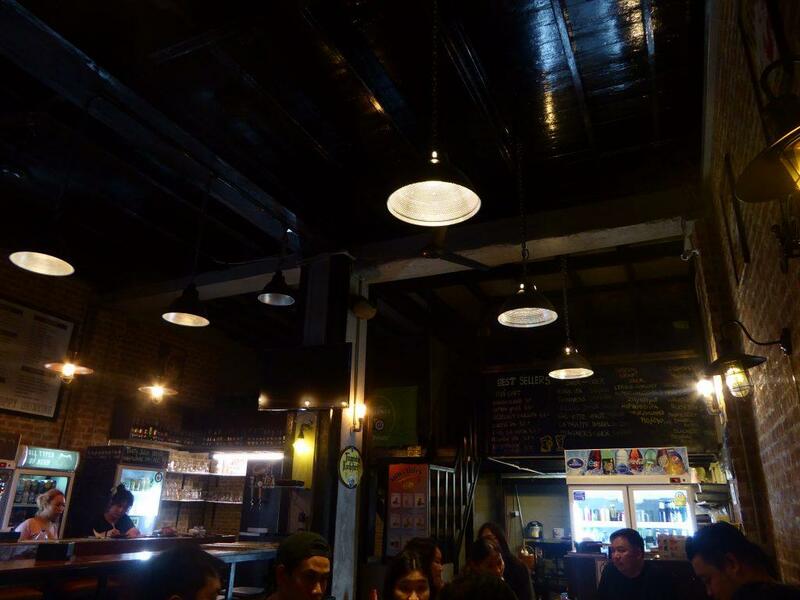 It has the largest selection in Thailand at its bar on Sukhumvit Soi 11. The draft beers include Leffe, Hoegaarden, Stella, Punk IPA, Guinness and rotating guest beers as well as over a hundred bottles with large selections from Belgium and the USA with many exclusive. 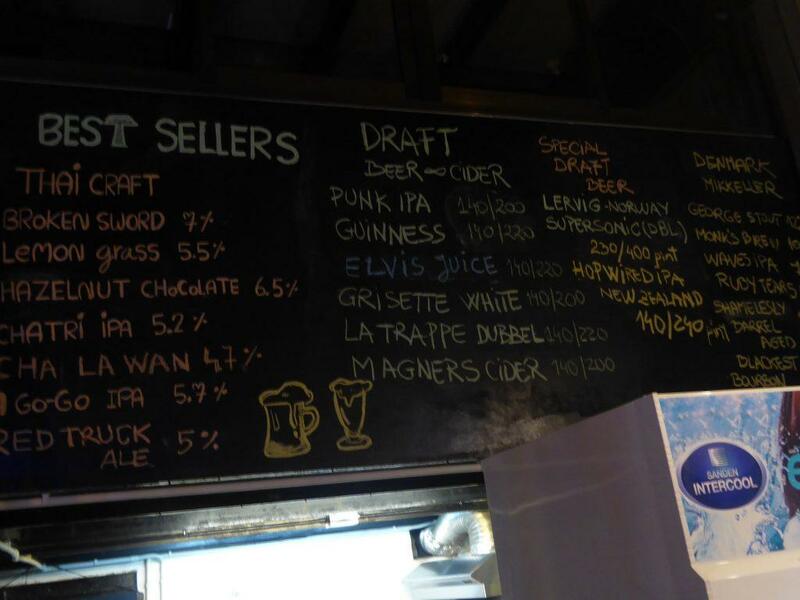 The beers mostly go for 250-300 baht a draft pint and 200-300 for bottles. There is an attached Daniel Thaiger booth with top quality burgers at reasonable prices. 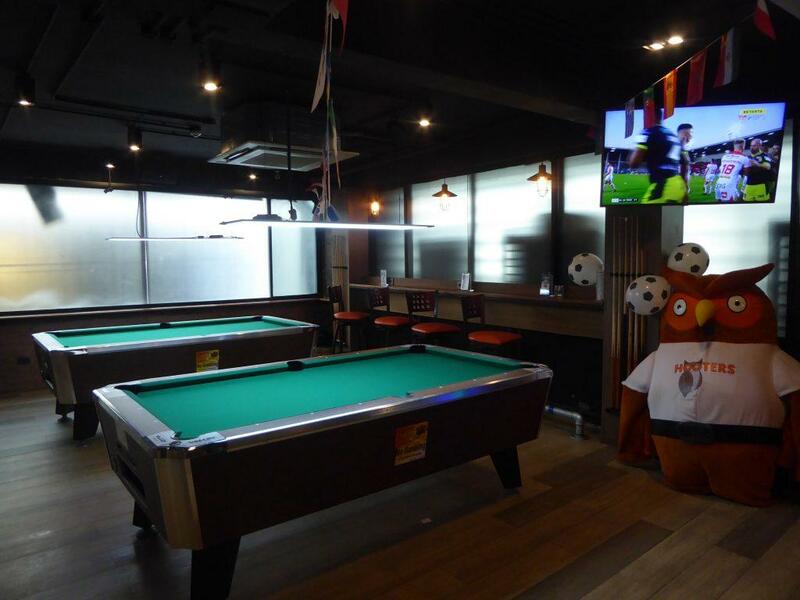 The bar has table seating over two floors, with live sport on TV and great views of the street from its street-side seating. Service is efficient and friendly. Location: Sukhumvit: 30 Sukhumvit Soi 11, Bangkok. Getting There: BTS Nana (exit 3). Turn left into Soi 11. The bar is about 10 minutes’ walk on the right-hand side. 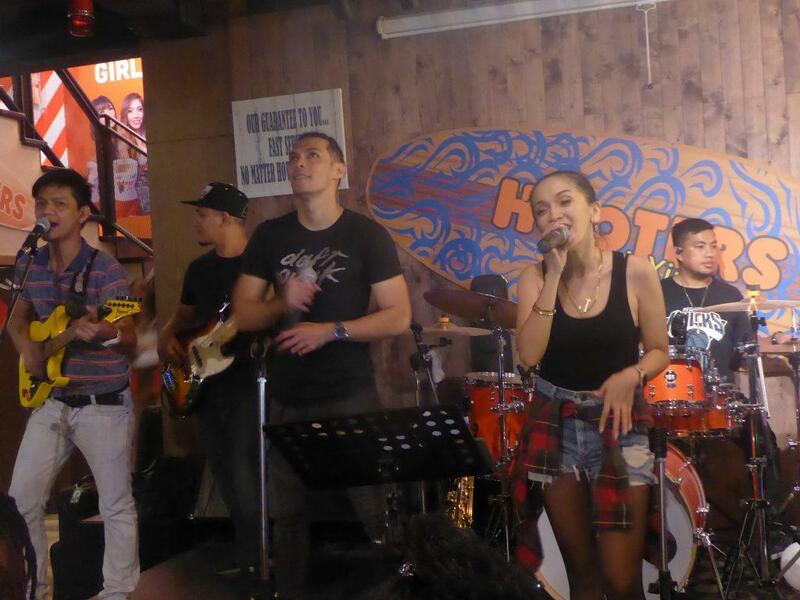 Buddy Beer is a long-standing Khaosan bar going back to the 90’s in name despite several changes of location. Its current home is in the middle of Khaosan Road in an attractive open-air courtyard setting with an attached 2 story brick and wood covered bar with a terrace and an upstairs lounge and balcony. There is a Thai and International food menu at reasonable prices as well as a meat and seafood BBQ from 150-400 baht. The bar has a full range of drinks including Hoegaarden on draft. Beers start at 140 baht and cocktails from 250 baht with buckets at 350 baht. 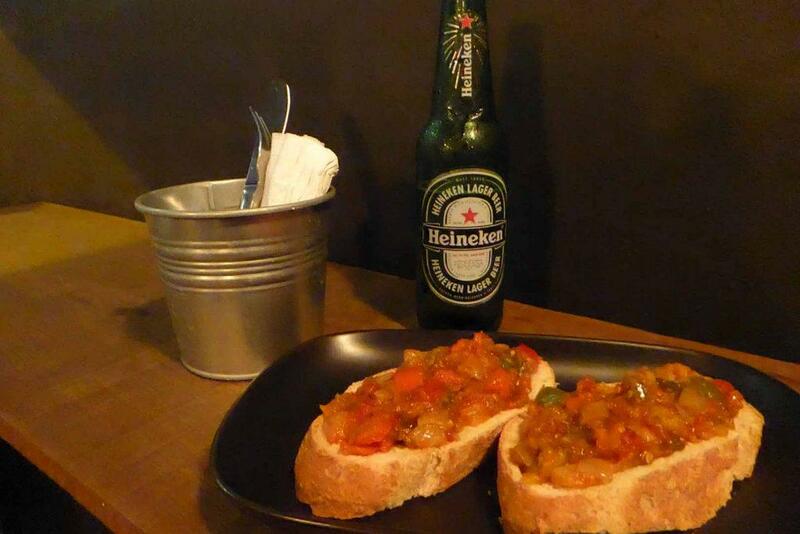 Buddy is a pleasant place for an evening drink or meal in a relaxed, clean environment. 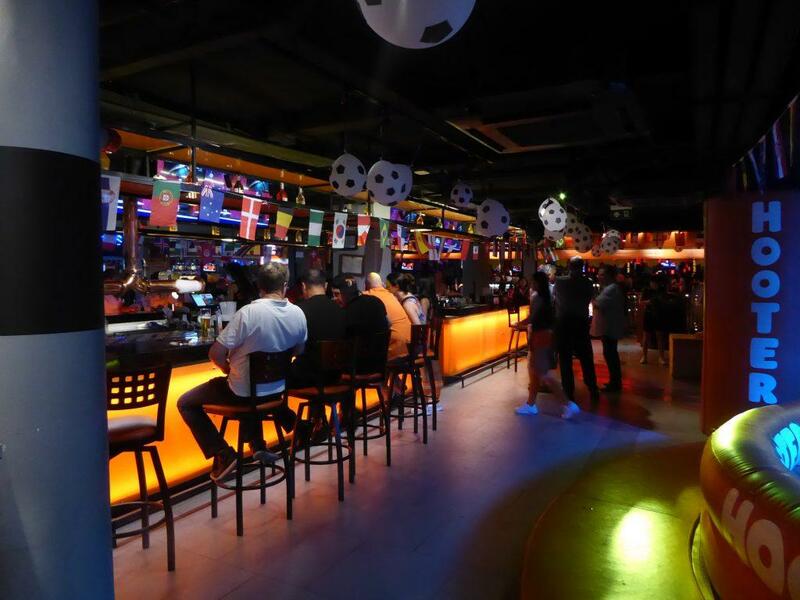 It’s also a good place to watch late 2/3am football matches with the commentary as they stay open for late games. Usually, a big screen is erected in the courtyard. Location: 201 Khaosan Road, Bangkok. Getting There: Taxi to Khaosan Road. 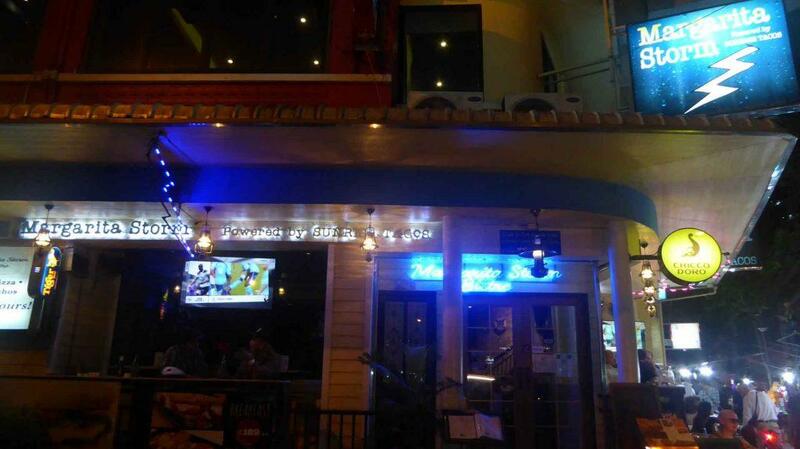 Buddy’s is a small cozy bar and grill on Sukhumvit Soi 22 sporting an American diner décor. 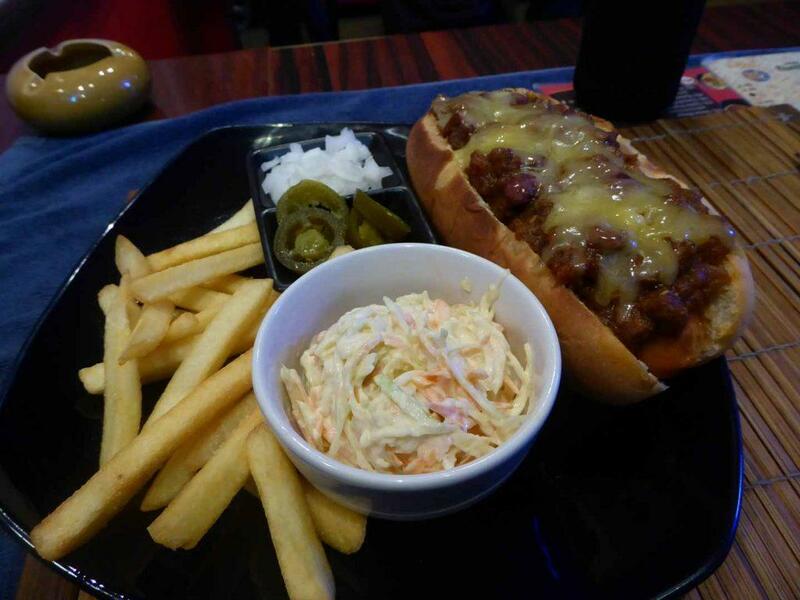 The bar food is excellent and specializes in burgers and dogs as well as serving Mexican, pizza, Thai food and a range of bar snacks. 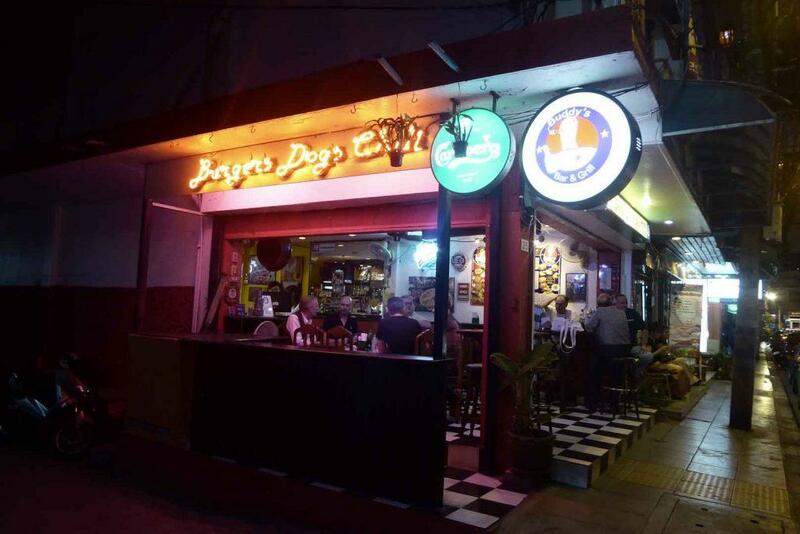 Burgers and dogs range from 195-215 baht and pizzas at 280 baht and all-day breakfasts at 195 baht. Drinks are inexpensive with beers from 85 baht, spirits and cocktails from 120 baht, and wine 130 baht. 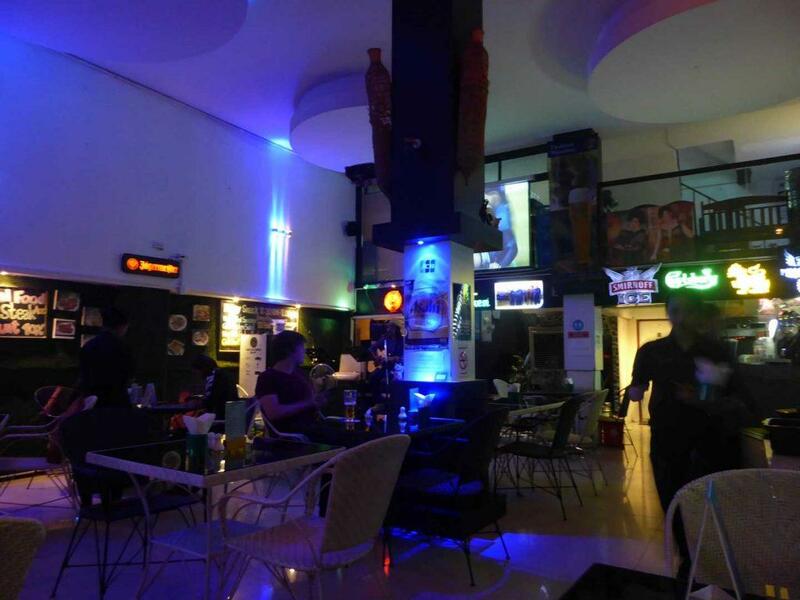 The atmosphere is good with friendly staff and a crowd of expat regulars. There is live sport on TV and a dart board. 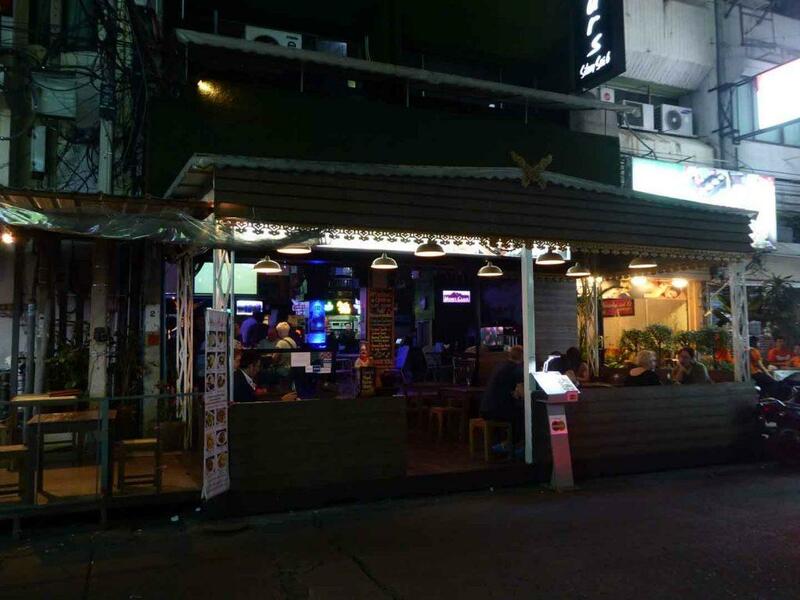 The bar is a short walk from the mouth of Sukhumvit Soi 22. Location: 2/5 Sukhumvit Road Soi 22, Bangkok. Getting There: BTS Asoke (exit 6), BTS Phrom Phong (exit 6), MRT Sukhumvit (exit 2). 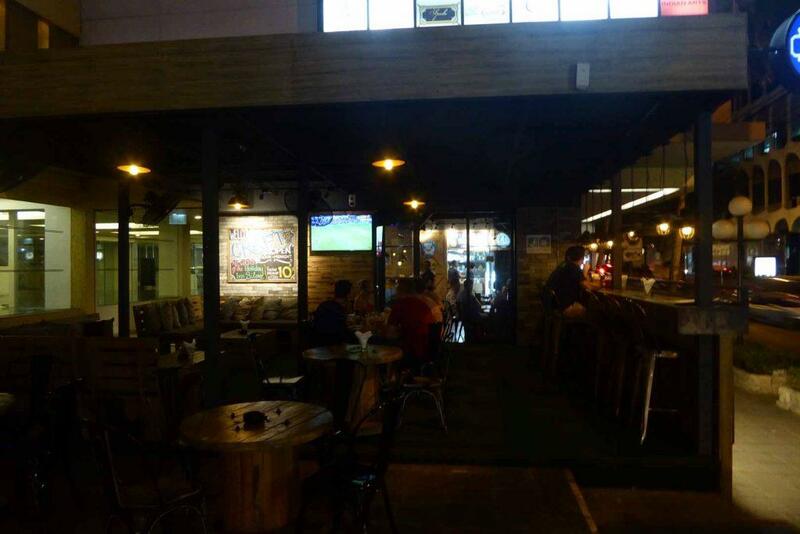 Craft is an open-air bar on Sukhumvit Soi 23 specializing in premium craft beers with a rotating selection of up to 170 craft beers from around the world with 4 on tap and a large selection of bottles. 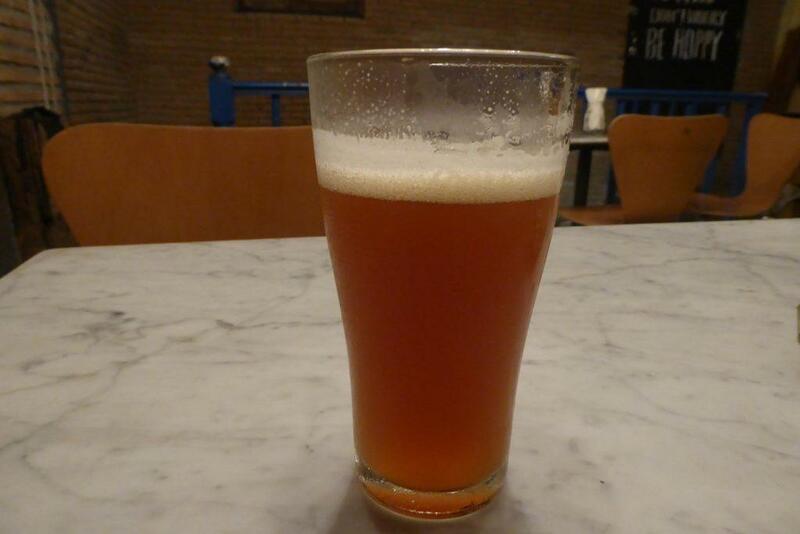 There are some outstanding beers, however, it’s not cheap with a pint costing from 290-590. Half pints from 190-490 baht and 100ml glasses 80-200 baht. Tax and service (17%) are added to the bill. Good bar food such as burgers, pizza, and nachos. There is a Taco kitchen attached to the bar with 80 baht tacos. Location: 16 Sukhumvit Soi 23, Bangkok. Getting There: BTS Asoke (exit 3) cross the intersection and continue up Sukhumvit road, turning left into Soi 23. The Craft is a 5-minute walk down the soi on the right. MRT Sukhumvit (exit 2). Walk up Sukhumvit road, turning left into Soi 23. Craft is a 5-minute walk down the soi on the right. Craft is a bar on Silom Road specializing in premium craft beers with a rotating selection of up to 170 craft beers from around the world with 20 on tap and a large selection of bottles. There are some outstanding beers, however, it’s not cheap with a pint costing from 290-590. Half pints from 190-490 baht and 100ml glasses 80-200 baht. Tax and service (17%) are added to the bill. There is an outside open air covered terrace and an air-conditioned indoor bar. 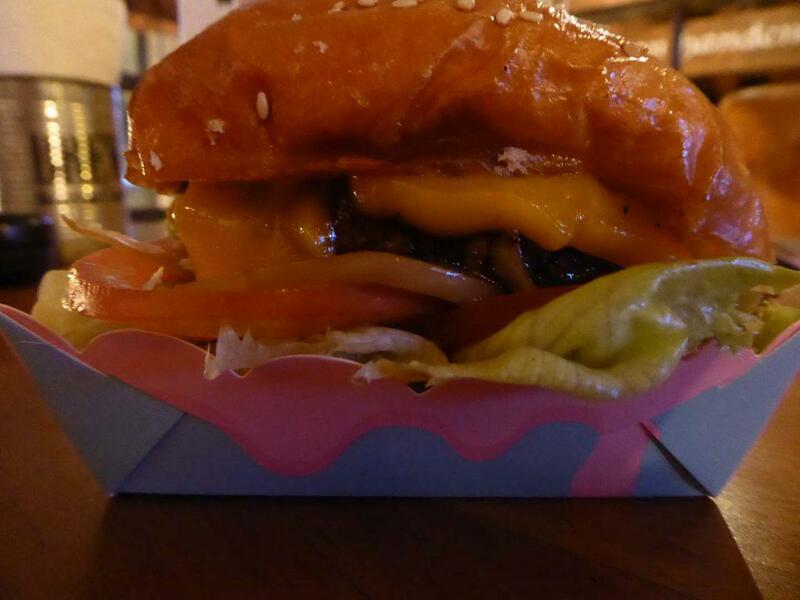 There is a small selection of bar food such as burgers, nachos, and wings. 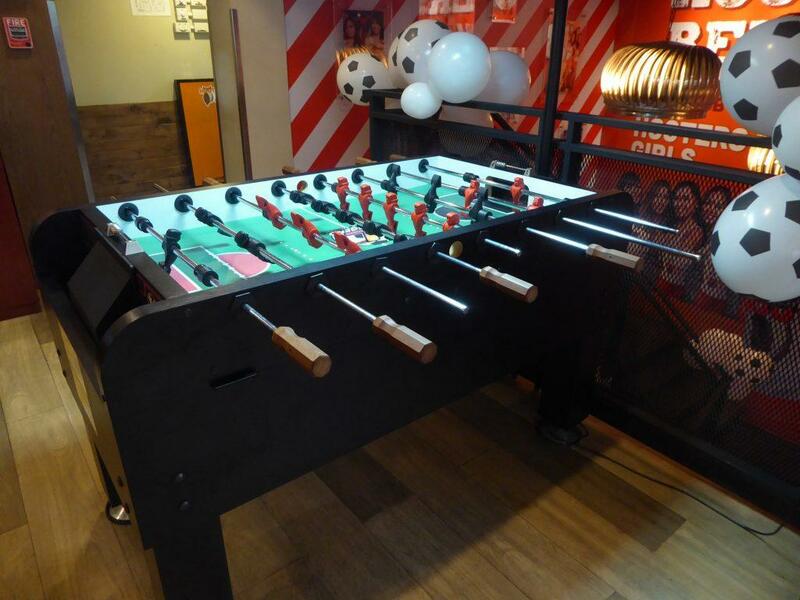 The bar is located on the ground floor of the Holiday Inn at the junction of Silom and Surasak roads. Location: Holiday Inn, 981 Silom Road, Bangkok. Getting There: BTS Surasak (exit 1). Turn right on to Surasak Road. Craft is on the right-hand side. 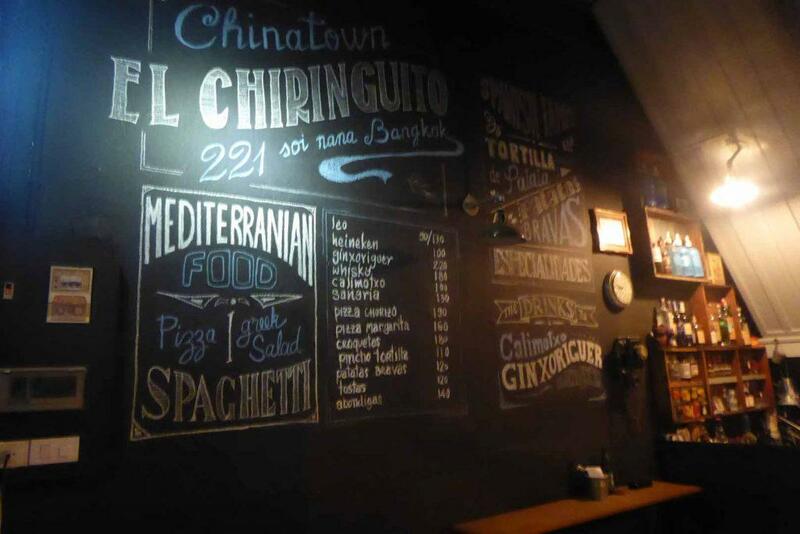 El Chiringuito is a Spanish style tapas bar in an old shophouse on Soi Nana in Chinatown. The bar’s interior has a retro feel furnished with antique tables and chairs, old jars and posters and a chalkboard menu on the wall. There is a small inexpensive food menu on the chalkboard comprising of Mediterranean favorites such as Greek salad, patatas bravas, croquetas, pincho tortilla, tostas, abondigas as well as spaghetti, pizza chorizo and pizza margarita at 110-190 baht. There is a small but select drinks menu with beers starting at 90 baht, sangria at 130 baht, calimtxo (red wine & cola) at 100 baht and Spanish Xoriguer gin at 220 baht. The daily specials are on the board. Ask about the beers available as they are not always listed. There is usually live music after 21.00. Location: 221 Soi Nana, Yaowarat, Bangkok. Opening Hours: 18.00-24.30 Thursday-Sunday, Closed Monday-Wednesday. Getting There: MRT Hualamphong (exit 1). Continue to the junction and cross the canal. Continue down Maitri Chit Road and turn left into Soi Nana. 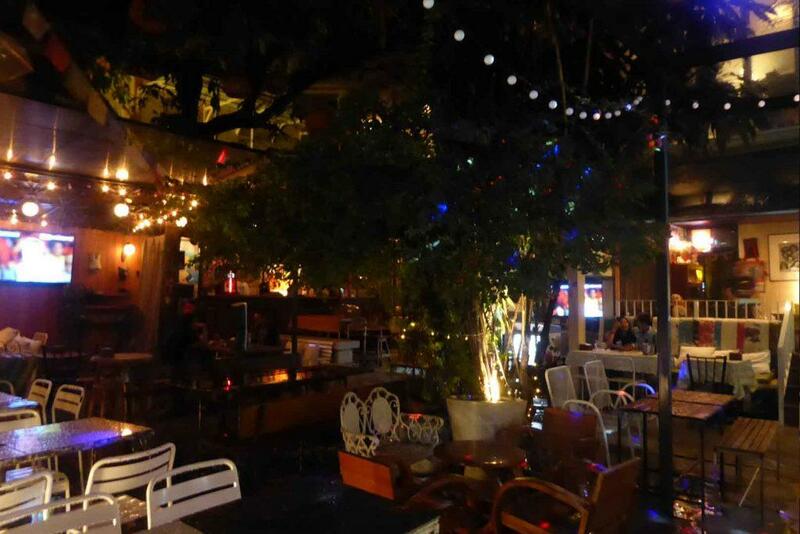 Hippie de Bar is in an old 2 story wooden house with an open-air garden courtyard. The covered entrance is on Khaosan road with the bar and courtyard just inside and the house behind. The house is furnished in retro style with vintage sofas and armchairs you can sink into around low tables. The house is full of vintage stuff like old televisions, pop art posters, musical instruments, and various knick-knacks. There is a large mostly Thai food menu with some western dishes. A full bar is available with beers starting at 140 baht and cocktails from 280 baht. 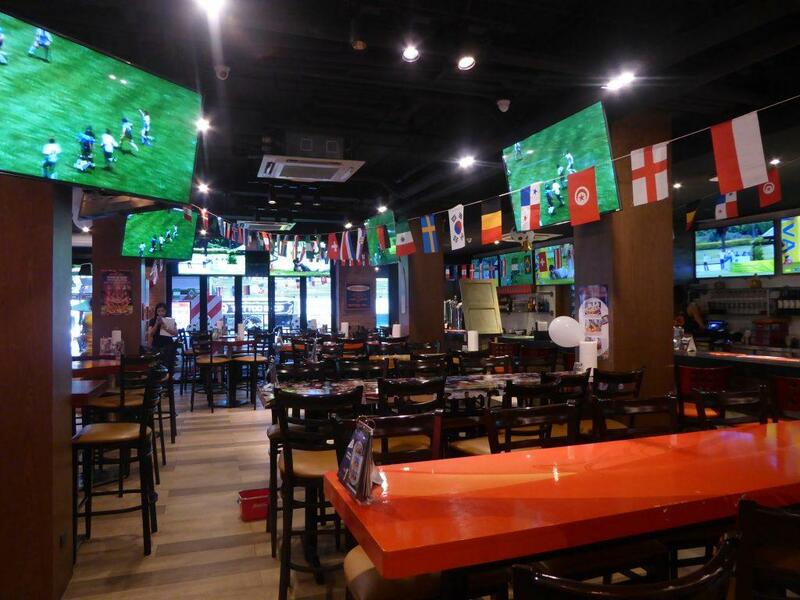 There are large screens for watching sport and the EPL is popular here at weekends. The bar music is rock, alternative and Indie and there is a pool table upstairs in the house. 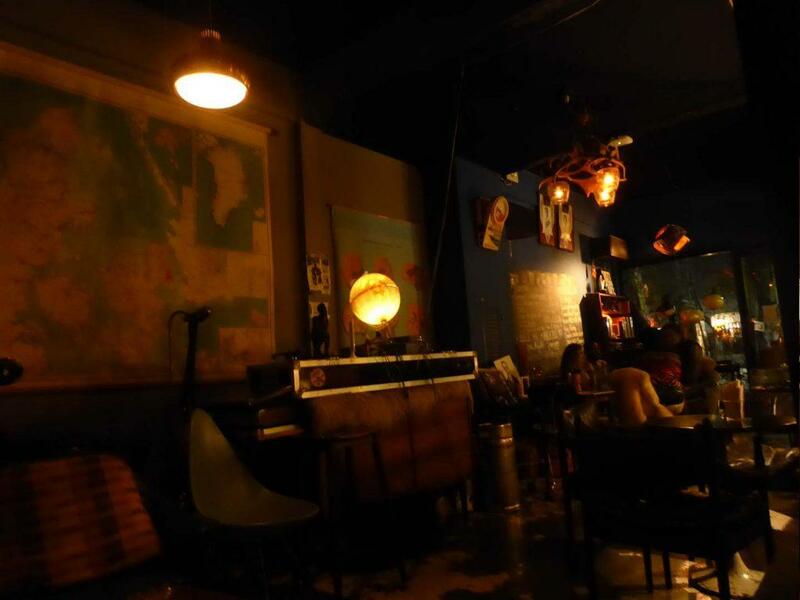 Hippie is more expensive than the backpacker bars but is still fair value and draws more of a mixed crowd of young locals as well as travelers who want a quieter place away from the busy street and thumping techno music. Location: 46 Khaosan Road, Bangkok. 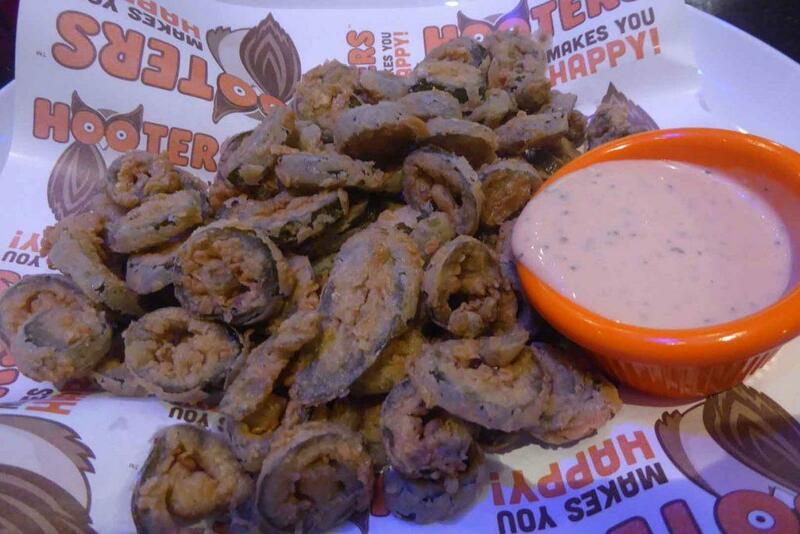 Hooters is a world-famous American sports bar franchise. There are three branches in Bangkok at Sukhumvit Soi 15, Soi 4 and Silom. The well-tested recipe is cold beer, an all-American food menu featuring burgers, ribs, wings, nachos, fish n’ chips, salads, soups, and sandwiches in generous portions, live sports on TV, a fun atmosphere, and attractive dancing waitresses in tight shorts and tops. The food isn’t cheap with most mains in the 350-750-baht range though portions are bigger than in most places. Beers start at 140 baht and cocktails at 280 baht. Hooters even have their own Hooters beer brand on tap and allegedly brewed by Hooters girls. All prices have tax and service (17%) added to the bill. There is a daily happy hour from 14.00-18.00 and daily specials such as all you can eat ribs and a pint of beer for 799 baht on Tuesdays and all you can eat wings for 599 baht on Wednesdays. There is live coverage of English and Spanish football at weekends sometimes with commentary and playbacks of American sports. All branches have a DJ and live music. The Hooters group dance occurs every 30 minutes and the staff all speak good English and are friendly. 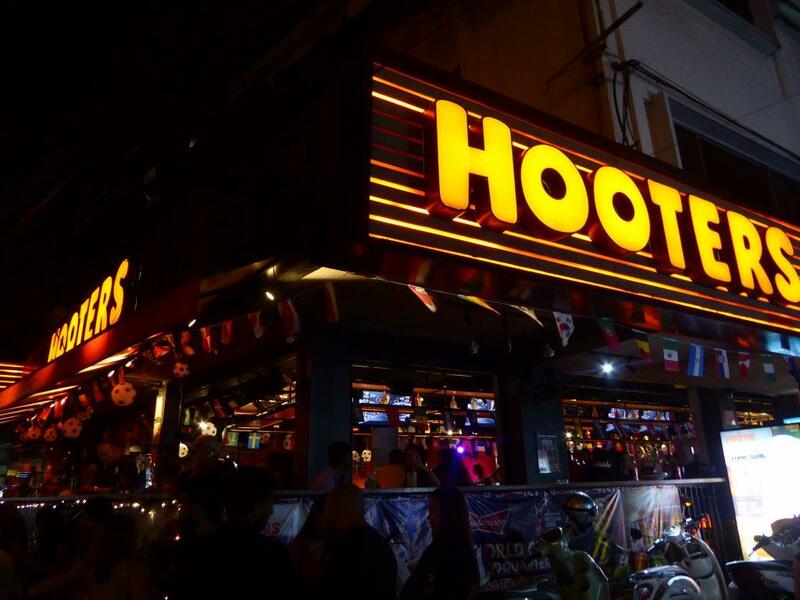 Hooters is first and foremost a fun bar with a good atmosphere and a varied clientele of tourists, expats and local Thai’s. The bars are noticeably popular with English speaking Asian tourists. 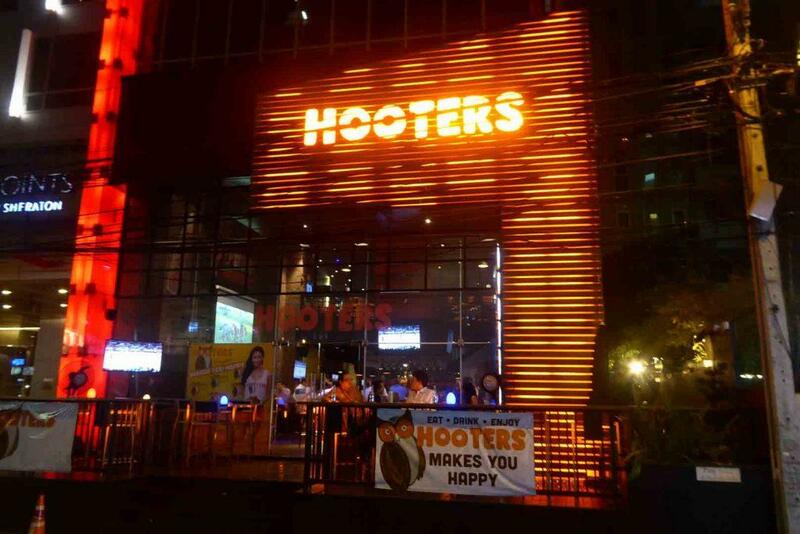 Hooters Silom has taken over the old site of Flan O’ Briens Irish pub. 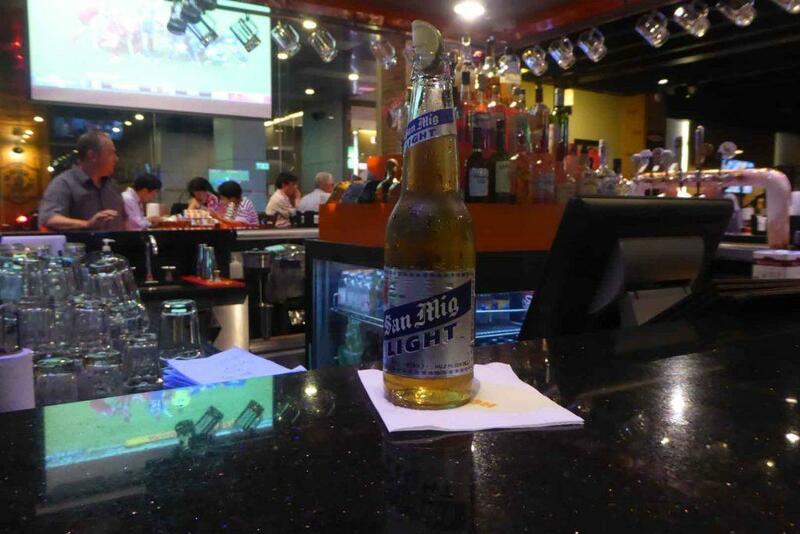 There is a large seating area on the ground floor with many screens showing live sport and a stage featuring live music from a talented Filipino band who play all the rock classics. Upstairs is another bar with views of the stage below, pool tables and a table football machine. Location: Silom Road, on the corner of Soi Thaniya, Bangkok. Getting There: BTS Sala Daeng Station (exit 3). The Sukhumvit Soi 4 branch is located opposite Nana Plaza. There is plenty of seating around the long bar and inside the bar as well as a terrace with high stools at the front which is great for people watching. 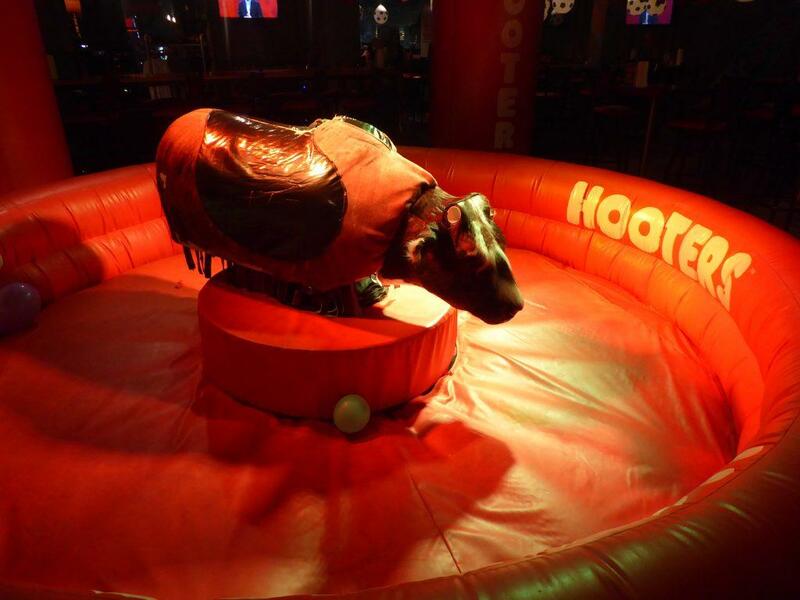 If you fancy a free beer have a go on the mechanical bull, you can win a free beer if you can stay on for 30 seconds. There are DJ’s and occasional live music. There is also a pool table and an air hockey table. Location: 4, Sukhumvit Road Soi 4, Bangkok. There is usually a live DJ and occasional acoustic music. There is a square bar in the center, an upstairs balcony and a terrace outside. Location: 4 Sukhumvit Road Soi 15, Bangkok. 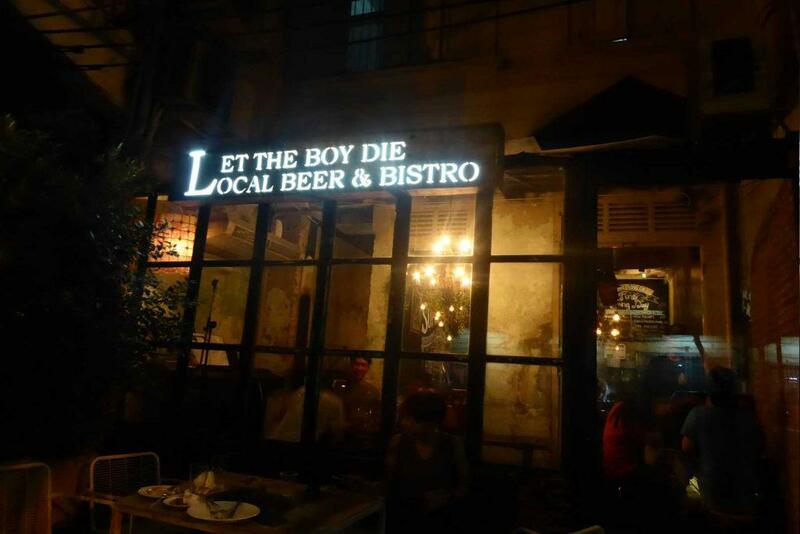 Let the Boy Die is a locally brewed craft beer bar in Chinatown. 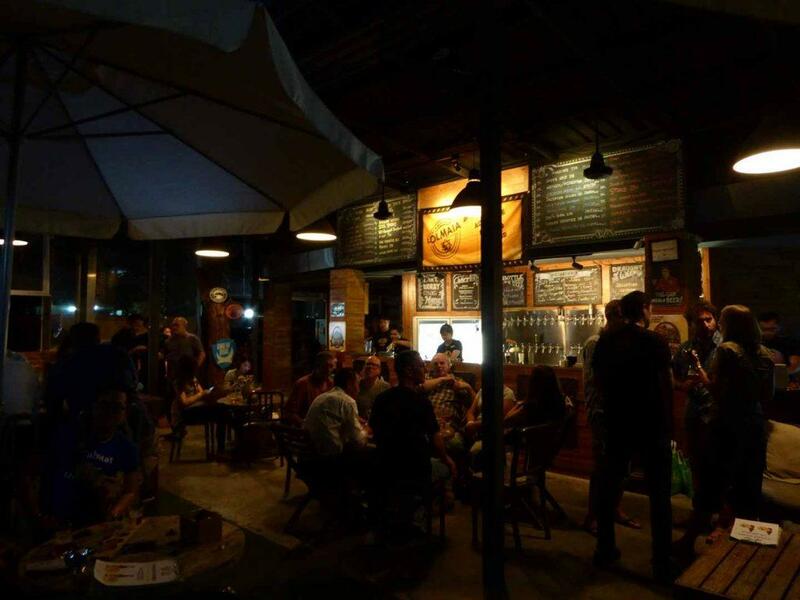 The superb tasting beers come from Bangkok’s Golden Coin brewery who also own the bar. The bar has two floors. The ground floor has long benches and tables at either side with a small bar at the back while upstairs there are a few more tables. There is a small outside terrace and a small stage for live music just inside the entrance. 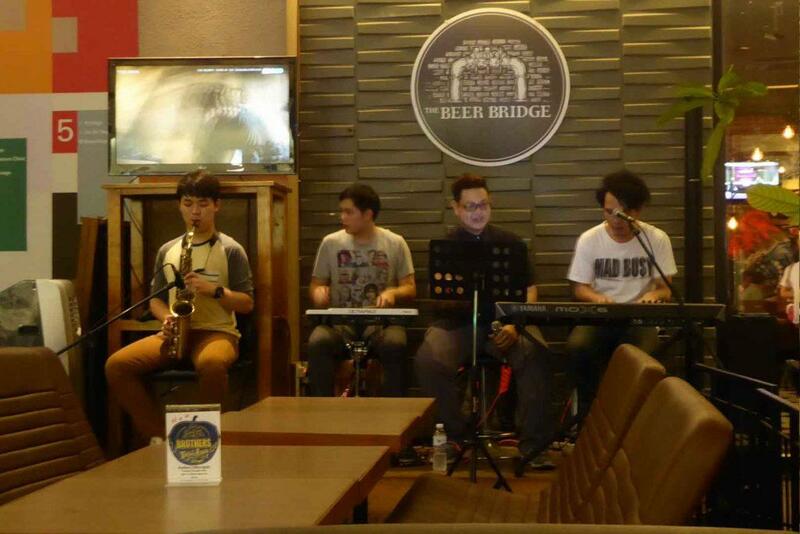 The live music is usually acoustic rock, pop, and soul with jazz on Friday’s and a DJ on Saturdays. The day’s food and beer menu are on a chalkboard above the bar. There are usually 12 rotating beers on tap including IPA, American Pale, Stout, Amber Ale, Weizen, and Witbier at 160-200 baht for a half pint as well as a selection of bottles. The short food menu usually features burgers, steaks, fish & chips, wings, sausages and pork knuckle ranging from 200-360 baht. The crowd is mostly locals with a few expats. If you’re not staying in Chinatown, it’s an easy taxi ride from Hualamphong or the Khaosan area. The beer is worth the trip! Location: 423-425 Luang Road, Yaowarat, Bangkok. Getting There: MRT Hualamphong Station (exit 1). Then take a taxi to Luang road. 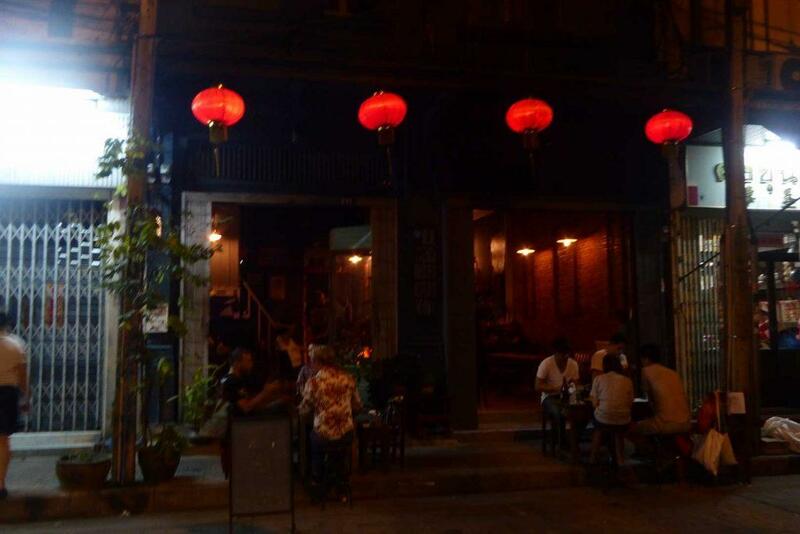 The bar is a few minutes walk from the BMA Hospital on Luang road which taxi drivers should know. Walk: Exit 2 from Hualamphong. Cross the canal and turn right onto Krung Kasem Road, keep walking and take a left into Luang Road. Keep walking and the bar is on the right-hand side. The walk will take 15-20 minutes. 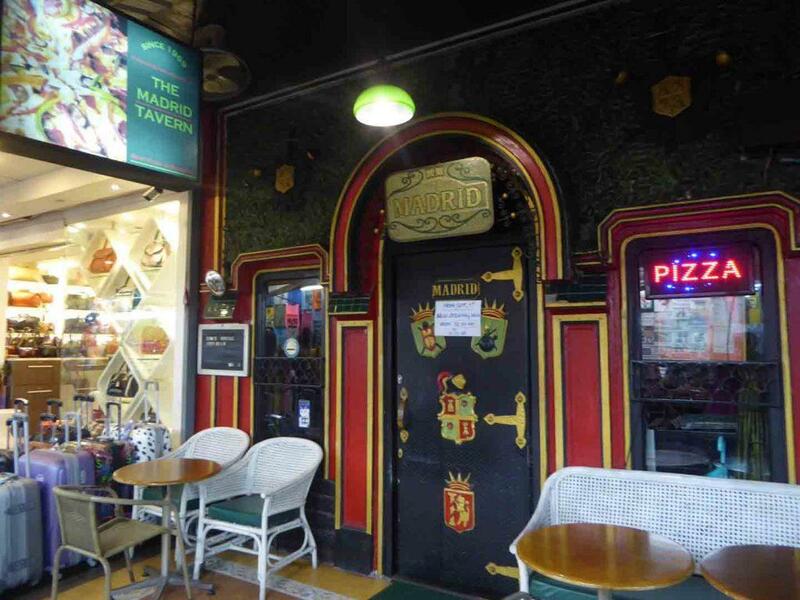 The Madrid bar first opened its big door back in 1969 and was a popular spot with US soldiers and pilots fighting in Vietnam, and after with CIA/DEA agents involved in clandestine operations against communists. 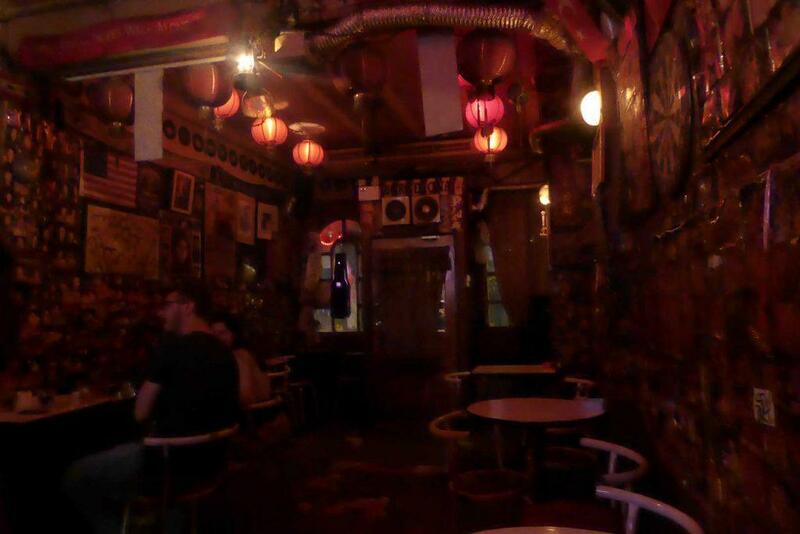 The bar is still going strong and is a popular spot with older expats including the odd surviving Vietnam vet. 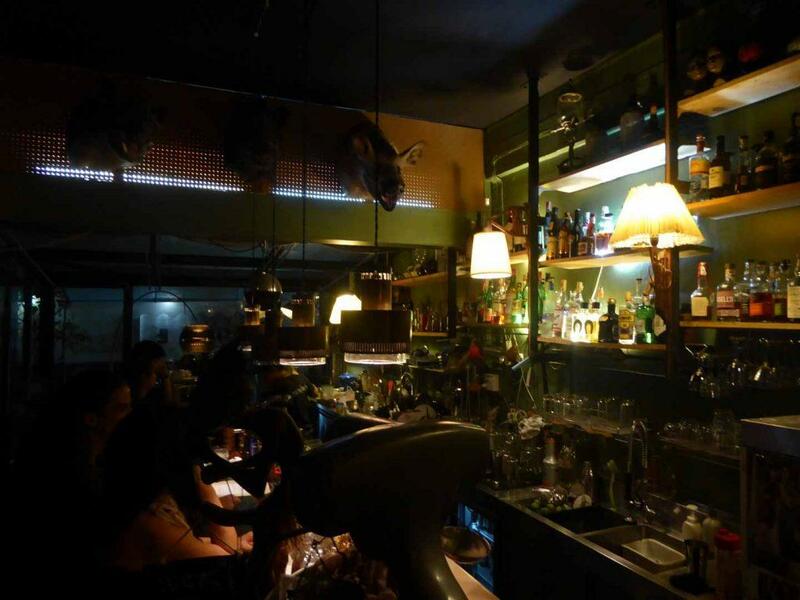 The Spanish theme doesn’t stop with the name as the décor features Spanish style crests and emblems, door hinges, black metal grilles and a large picture of a bullfighter in action behind the bar. The interior has small booths along one side and a long bar on the other side. 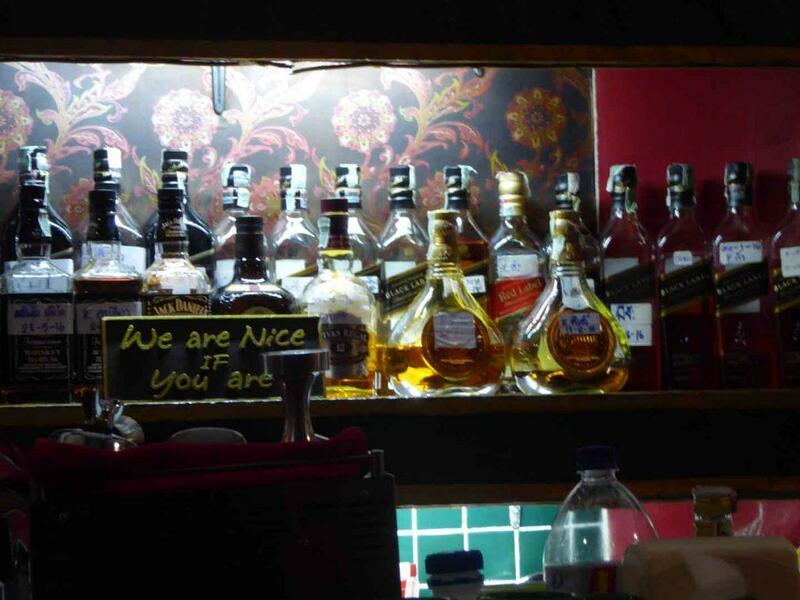 There are lots of open spirit bottles with customer’s names on stacked on a shelf behind the bar reflecting the number of regulars. 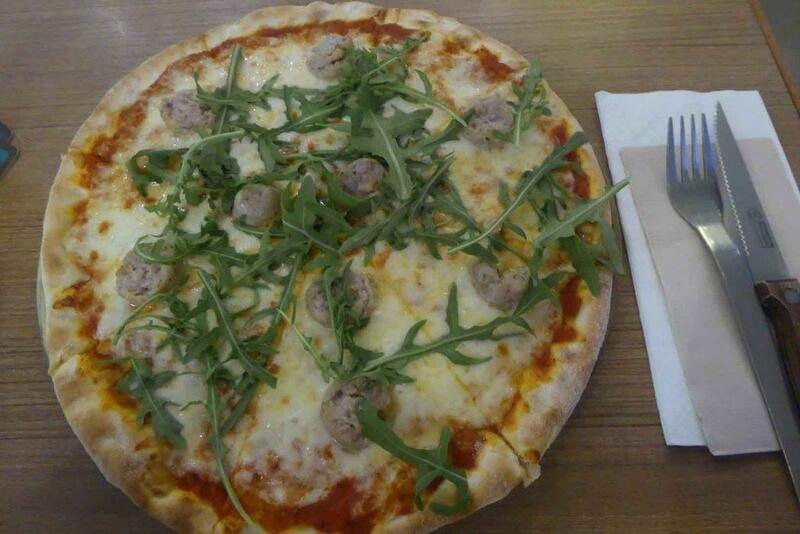 Madrid is famous for its American style thin crust pizza that comes in 3 (American) sizes and includes a build your own option from a lengthy list of ingredients. Check out the Thai style Larb Kai pizza. There is also a large menu of American and Thai food including sandwiches, burgers, dogs, steaks, and even gumbo. Madrid also opens early for American style breakfasts. Food and drinks are inexpensive. The crowd are mostly older expats and locals with only a few tourists. Location: 78/3 Patpong Soi 1, Silom Road, Bangkok. Getting There: BTS Sala Daeng Station (exit 1), MRT Si Lom Station (exit 2). 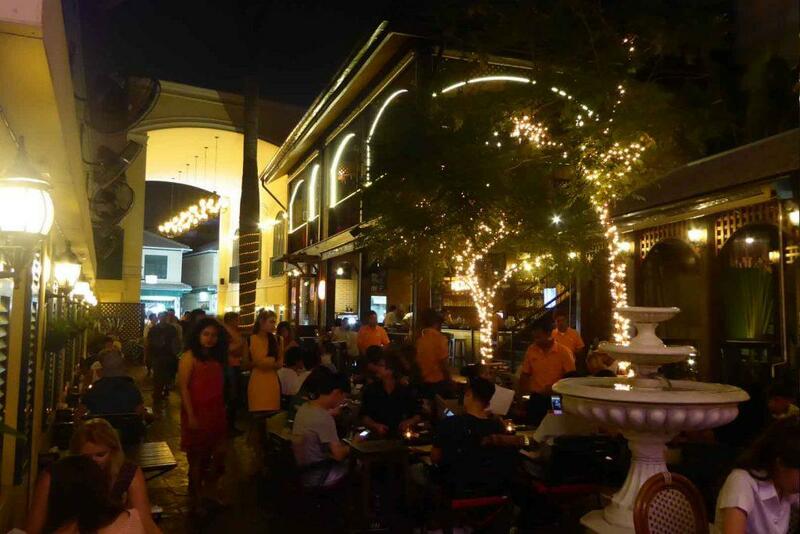 Margarita Storm is a 24-hour bar-restaurant on the corner of Sukhumvit Soi 13. The food is Mexican and classic American. 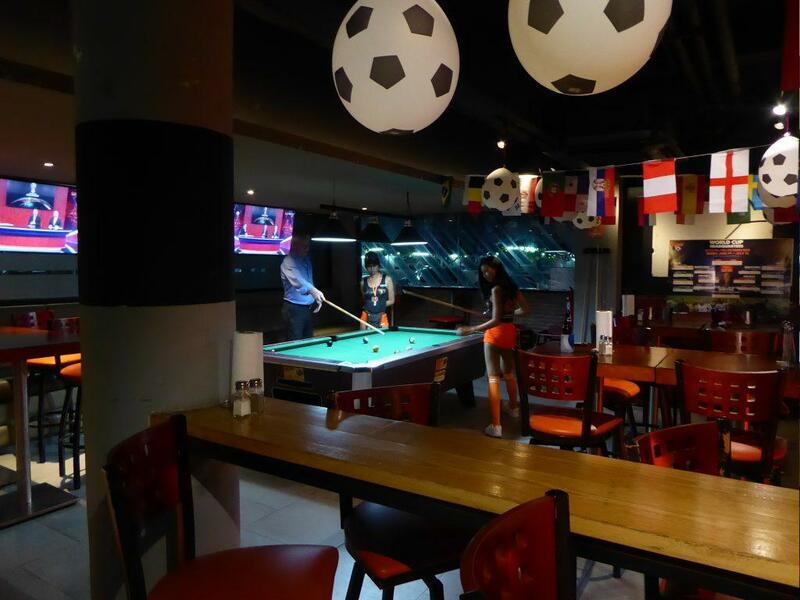 There is air-conditioned dining on the ground and 1st floors in mainly American diner style booth seating and an outdoor terrace overlooking the street which is great for people watching on busy Sukhumvit road. There is several TV’s showing sport. The Mexican food is good with a menu from Sunrise Tacos. There is also a classic American menu with dogs, burgers, wings, and steaks etc. Prices are reasonable with mains from 150-450 baht. Chips come with a choice of 10 different home-made salsas. 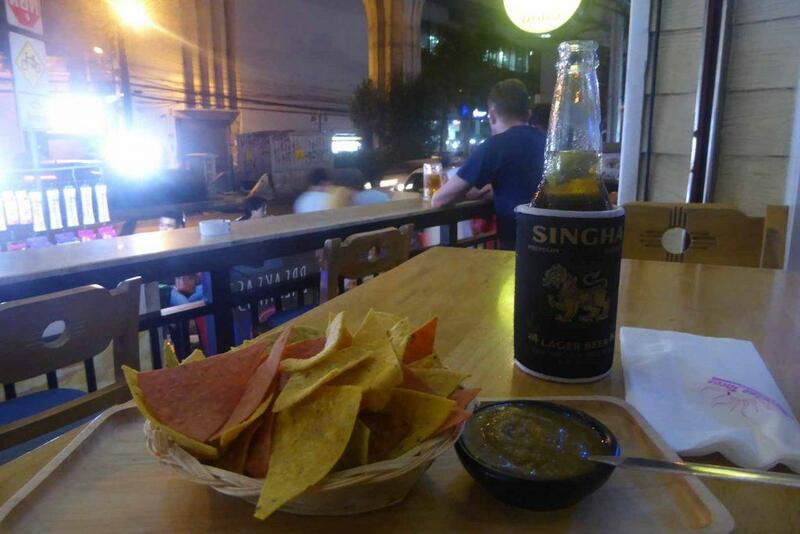 There is a full drink menu including beers from 115 baht, tequilas from 110 baht, margaritas from 180 baht, soft drinks from 60 baht. Location: 21/2 Sukhumvit Road, (corner of Soi 13), Bangkok. Getting There: BTS Asoke Station (exit 1), BTS Nana Station (exit 3), MRT Sukhumvit Station (exit 3). 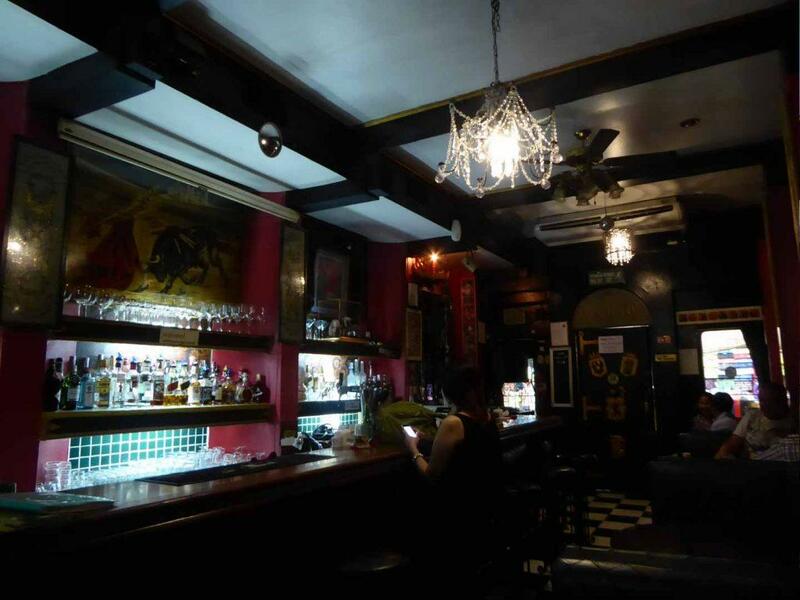 Shades of Retro is an intimate neighborhood bar set in an old renovated garage in the Thonglor area of Bangkok. The bar is furnished with retro furniture, antiques, and collectibles from the 50’s, 60’s, and 70’s such as old sofas, armchairs, maps, lamps, telephones, stereos, old clocks, fans, record players, vinyl records, musical instruments and even an old Vespa scooter and a vintage surfboard giving it the feel of a bar set in an antique shop. There is a short food menu featuring Thai dishes and western favorites such as burgers, dogs, and wings. Beers start at 140 baht, spirits from 180 baht, wine 180 baht a glass and cocktails from 220 baht. 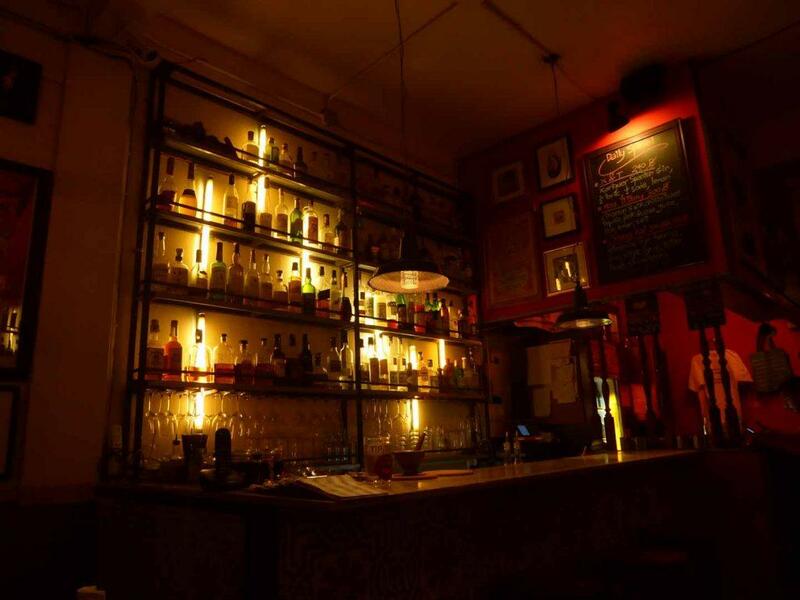 The bar music is mostly jazz, soul, and rock with occasional live DJ’s spinning old vinyl. The seating is comfortable on old sofas or stools at the bar as well as a couple of outdoor tables. 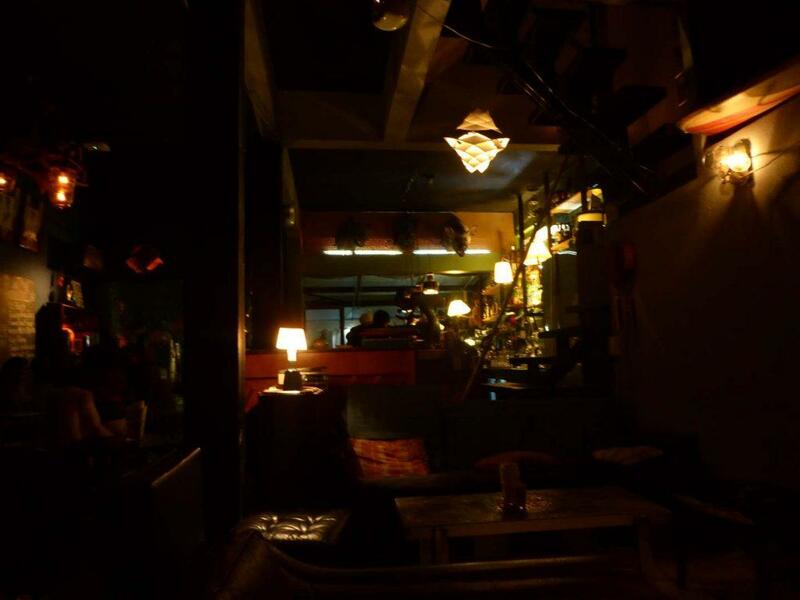 The dim lighting complements the casual, relaxed atmosphere. The crowd is mostly a mix of locals and expats with the odd tourist. Location: 808/12 Thara Rom 2 Alley, Sukhumvit Soi 55, Bangkok. Getting There: BTS Thong Lo (exit 3). Turn left into Thonglor and Shades of Retro is a 15-minute walk on the right-hand side on Thara Rom 2 Alley just past the police station. 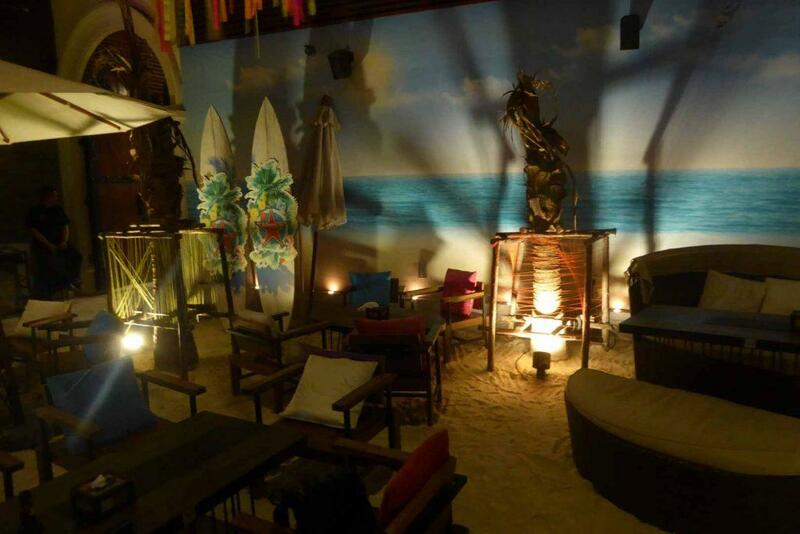 Superflow City Beach Club is an open-air beach bar and lounge modeled on an Ibiza style day and nightclub. 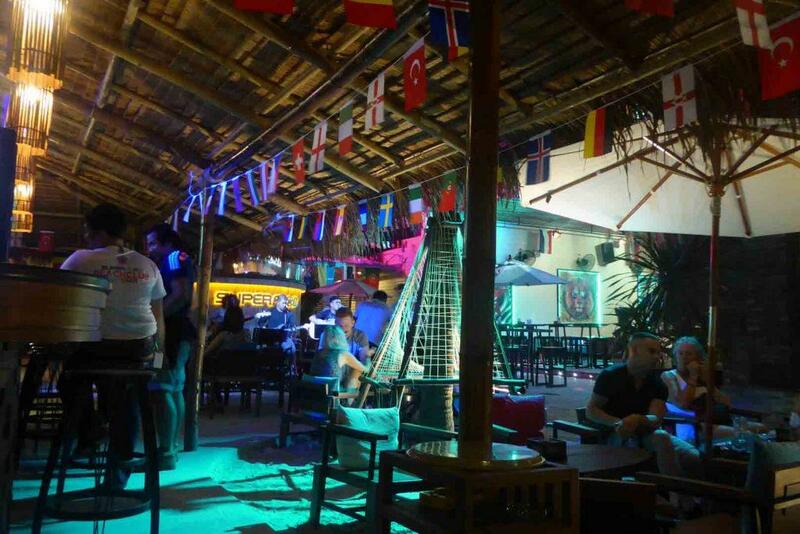 The bar comes complete with sand, beach chairs, daybeds, palm trees, murals and pop art on the walls, a beach hut style thatched roof DJ tower in the center and even surfboards. There is a dance floor and an in-house restaurant set in a colonial style house. The music is Ibiza style House and dance music as well as live bands playing acoustic rock n’ pop. Beers start at 90 baht, cocktails from 200 baht, and buckets from 300 baht. There is a daily happy hour from 19.00-21.00. Food wise the 17-year-old Tom Yam Kung restaurant serves classic Thai dishes and tapas-style smaller dishes mainly from 150-400 baht. The clientele is mostly young foreign travelers and young locals. There is a monthly full moon party for those who can’t make it down to the islands. Superflow City Beach Club is located at the police station end of the road. Location: 9 Khaosan Road, Bangkok. Teens of Thailand is a small shop house bar on Soi Nana in Chinatown. The interior decor behind the large wooden entrance door is vintage style with bare concrete walls adorned with some sensual art, only a few tables and even an old upright piano. The bar’s specialty is Gin with a large selection of different gins. The house cocktails are mostly gin-based starting at 300 baht and featuring ingredients such as pork jerky, pepper, sun-dried banana & Thai tea. Other spirits are available too as well as Singha Beer from 150 baht for a small bottle. Location: 76 Soi Nana, Charoen krung Road, Yaowarat, Bangkok. Opening Hours: 19.15-01.00 Wednesday- Saturday, 19.15-24.00 Sunday. Closed Monday/Tuesday. 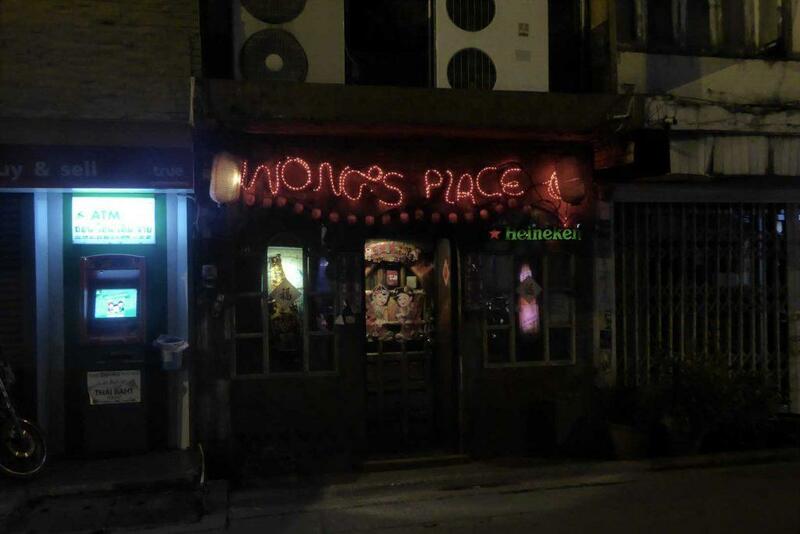 Wong’s is a late-night hole-in-the-wall bar in the original 1980’s backpacker HQ of Soi Ngam Duplee. The bar opened in 1987 and is still going strong under its original owners. 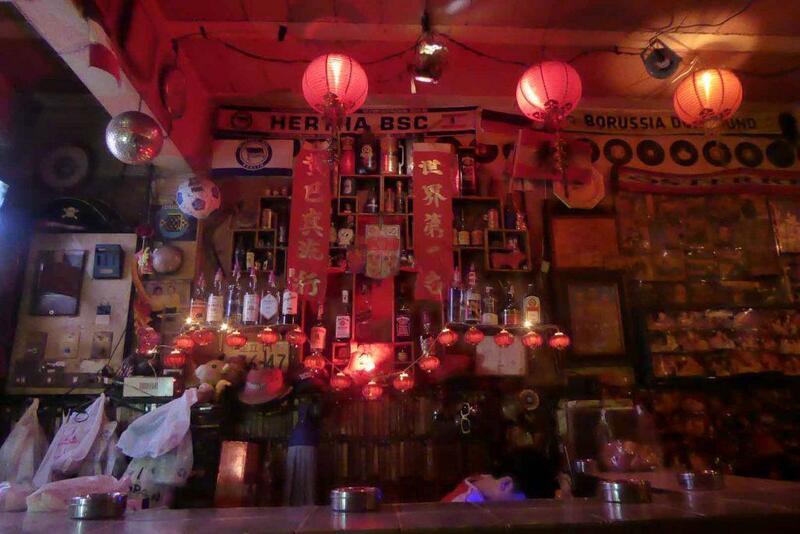 The dimly lit interior is fuelled by the red glow of Chinese lanterns and is decorated with flags, football scarfs, photos, vinyl records and various knick-knacks. The bar’s music is played via old VHS videos which are stacked behind the bar. There is also a dart board and live music on Saturday nights. The crowd is a mix of mostly expats, a few locals, and the odd tourist. Bar prices are reasonable with 120-baht beers. Slow drinkers are not popular here and the owner can be quite blunt if he thinks you’re not drinking enough. The bar stays open until the last person leaves and can get quite busy after 2 am. The best way to get here is by taxi and there are usually plenty of taxis in the neighborhood in the early hours to take you home. Location: 27/3 Soi Sribumphen (off Sathorn Soi 1). Near Malaysia Hotel. Getting There: Taxi or MRT Lumphini (exit 1). Walk up Rama IV and take a right into Soi Ngam Duplee and then a left into Soi Sribumphen (10-minute walk). 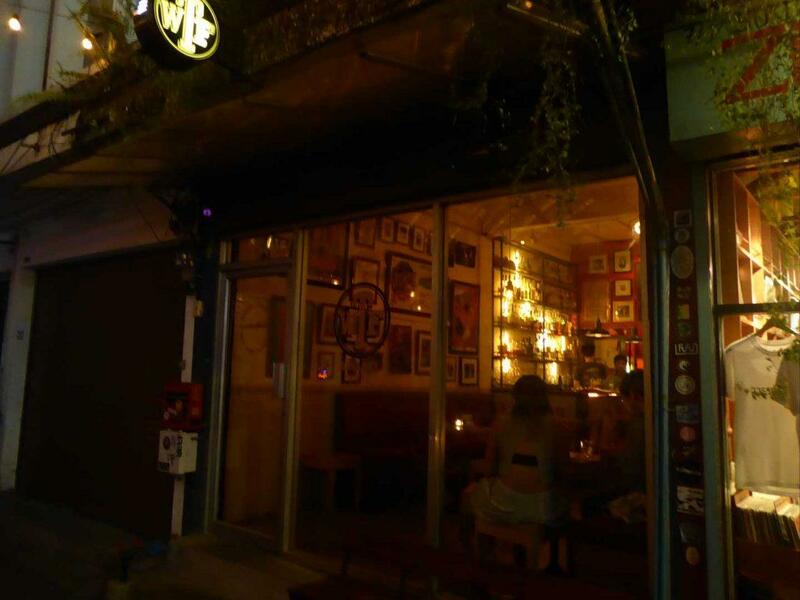 WTF is a small bar on Sukhumvit 51 that also operates as an art gallery. The ground floor is decorated with retro style furniture, film posters, and old pictures while the two upper floors host regular art exhibitions. The background music is mostly jazz, soul, Latin, Afro, rock, and hip-hop. There is a small selection of beers including Beer Lao from 140 baht while cocktails start at 200 baht and wine at 180 baht a glass. Close neighbors include a Japanese restaurant, Studio Lam, and Zungrangma Records. Location: 7 Sukhumvit Soi 51, Bangkok. 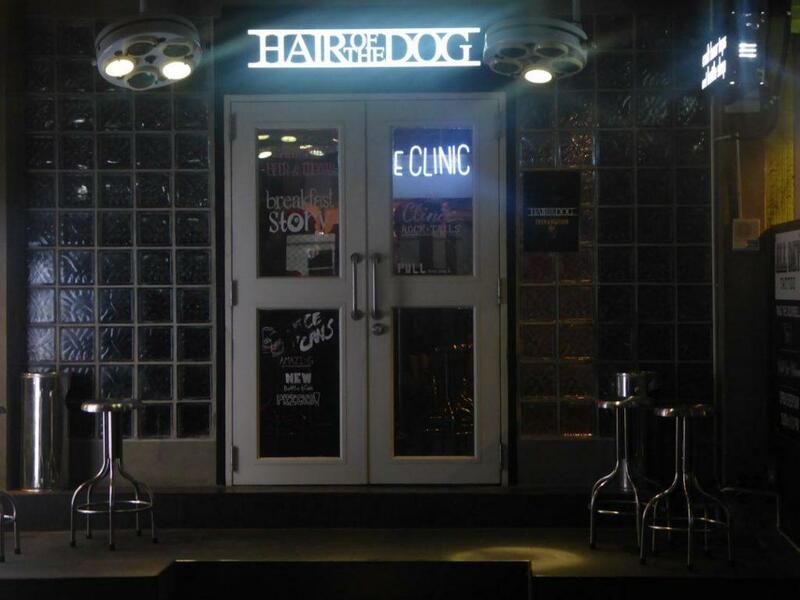 Hair of the Dog is a craft beer bar for serious beer enthusiasts. There are two branches on Sukhumvit 33/1 and in Mahatan Plaza which is next to Phloen Chit BTS station. 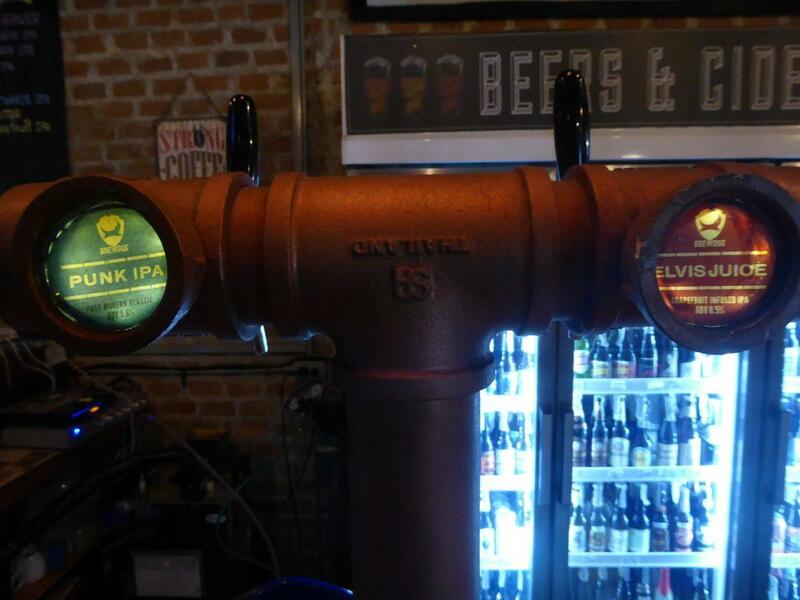 There are 13 rotating draft taps and hundreds of bottles available. 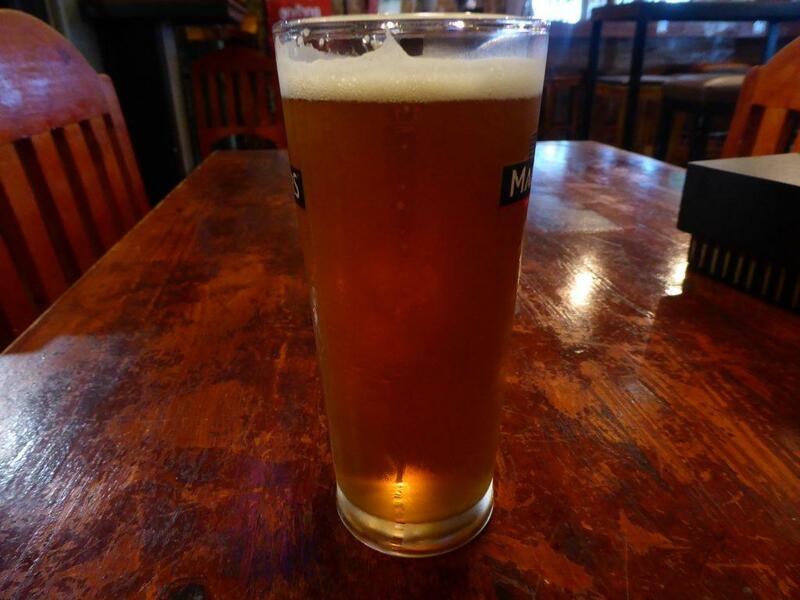 The tap beer is mainly imported from America or Canada with a few Asian brews. Beers aren’t cheap with prices ranging from 170 to 390 baht for a half pint plus tax and service. There is a small selection of bar food available. Snacks including fries, cheesy larb balls and poutine run from 161 to 236 baht. Mains including burgers and sandwiches run from 300-321 baht. Good service and staff who know their beer. Address: 593/27 Sukhumvit Soi 33/1, Phrom Phong, Bangkok. Getting There: BTS Phrom Phong Station (exit 5). Address: 2nd floor, Mahatan Plaza, 888/26 Phloenchit Road, Bangkok. Opening Hours: 17.00-24.00 Monday-Saturday. Closed Sunday. Getting There: BTS Phloen Chit Station (exit 2).